We have a long-standing history of being as efficient (*cough*) as possible here at Viget (see here, here, and here). We also have an ever-growing number of web apps and project-specific resources to monitor and update throughout the day. Manage those project links via Bookmarks and your folders start to rival Craigslist in terms of elegance and efficiency. Physically type (let alone remember) the URL? Come on...who has that kind of time? It was only a matter of time before I started looking for shortcuts. I've been using Alfred off-and-on for a while to launch applications and open files and thought “Wouldn't it be great if I could launch sites with Alfred?” A brief conversation with Jason later, and BOOM, I was launching Basecamp projects in 4 keystrokes. 1. 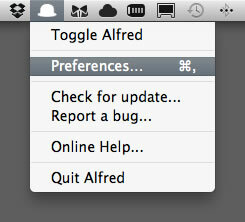 If you haven't already, download and install Alfred (it's free). 3. Select “Features” from the toolbar and select “Custom Searches ” within the sidebar. 4. Add a URL, the full display name and a keyword for that site. Click “Add” and you're done. 5. 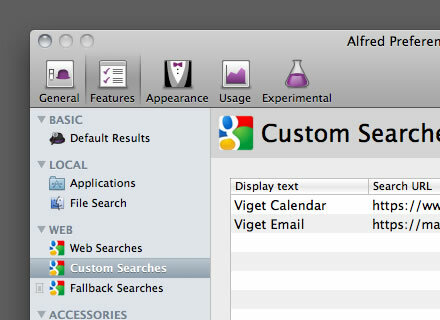 Try it out: Click Option + Spacebar to launch Alfred and begin typing your keyword. Hit “Return” and Alfred opens the site in your default browser. There are a number of additional uses for Alfred Custom Search (posting a tweet, adding events to your calendar), all of which are explained on their Help page, but I've found the simple act of launching a site to be indispensable. Have any Alfred tips of your own? Know how to do the same thing in Quicksilver or Google Quick Search Box? Let me know in the comments below.